Dwarf galaxies hold the key to our understanding of the make-up of the universe. Dwarf galaxies are similar to galaxies like our own Milky Way, except that they are much less massive and have a higher ratio of dark matter to stellar matter. The dark matter of a galaxy lives in its ‘dark matter halo’. The Milky Way and our nearby galactic neighbor, Andromeda, live in massive dark matter halos that contain sub-halos which can host dwarf galaxies. Based on the ‘ΛCDM’ model of our universe and simulations using the rules of ΛCDM, the more massive dark matter sub-halos should have sub-halos themselves. For example, Andromeda has a dwarf galaxy called M33, and M33 is the third most massive galaxy in our local group. The dark matter halo that M33 resides in should be massive enough to not only have sub-halos, but super-ultra-faint dwarf galaxies that reside in those sub-halos. These galaxies are so faint because they may only contain as few as a couple thousand stars. It just so happens that super-ultra-faint objects are super-ultra-hard to detect. Before we devote all our telescope time to survey the M33 region, we want to find out how many galaxies we would expect to find around M33 and what we can learn from them. Predicting the number of dwarfs around M33 depends on many factors, such as M33’s mass, distance from us, its orbital history, and even the laws that govern our universe. These dwarf galaxies that reside in ‘sub-sub-halos’ are going to be tiny (a few thousand to a few tens of thousand solar masses, while the M33 is ~ 1 billion solar masses). M33 has already been partially surveyed by the PAndAS survey. This survey was not sensitive enough to detect the faintest types of galaxies, and only surveyed ~30% of the M33’s dark matter halo. 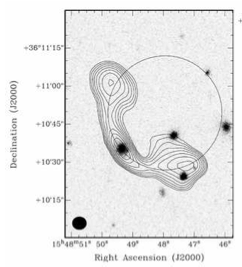 PAndAS found just one dwarf galaxy possibly associated with M33, called ‘And XXII’. Follow up observations need to be done to be sure that And XXII is gravitationally bound to M33 as opposed to Andromeda. But how many associated dwarf galaxies of M33 would we have expected to find in the PAndAS survey? And how many satellites should M33 have? And how will we find them? Today’s paper sets out to answer these questions using the a simulation that models the population of dark matter halos. The end goal is to calculate an average number of satellites in a given volume, and how many of those we would be able to see. They then have to consider other effects, such as how far away the host galaxy (M33 in this case) is from us, as well as the resolution of the telescope we are using. Their end result is visualized in Figure 2, and is based on two telescope examples. HSC is the Hyper Suprime-Cam on the Subaru Telescope and MC is the MegaCam on the Canada-France-Hawaii Telescope; both are located in Hawaii. If we started an M33 satellite search today, these two telescopes would be the best options since they are located in the Northern Hemisphere (where we can see Andromeda + M33), are large enough to survey M33, and operate in the right wavelength to detect dwarf galaxies. The PAndAS survey is represented by the yellow solid line, and its limiting brightness by the yellow vertical dashed line. You can then see that according to today’s paper, we would have expected the PAndAS survey to have found 3 satellites. It only found one. This is small number statistics, there isn’t a huge difference between 1 and 3 satellites, so there is really nothing we can conclude from that. Figure 2: The total number of satellites predicted to be around M33 at varying levels of brightness. The y-axis gives the number of satellites and x-axis is limiting brightness in units of magnitude on the bottom and solar mass at the top. Dashed lines are expected results for MC, solid lines for HSC. The colors correspond to different survey sizes, and the shaded region are predictions from another paper that used the same model as today’s paper. Figure 2 in paper. How many M33 satellites do we expect to find? The simulation that today’s paper relies on makes an initial assumption that the modeled galaxy forms in isolation. M33 certainly is not isolated, but to add another complication, the morphology of M33 suggests it has been ‘tidally disrupted’ (like the moon’s gravitational effect on our tides). And just for some added fun, the direction of motion that M33 follows suggests that it has recently been acquired by Andromeda, totally opposite of what the morphology suggests. These two scenarios will affect the number of satellites around M33. If M33 has had a close encounter with Andromeda, Andromeda would have stripped satellites away from M33. Today’s authors simulated that situation, and concluded that if M33 is observed to contain 4 satellites or less, this is probably the case. If more than 4 satellites are observed, it becomes extremely unlikely that M33 has made multiples passes around Andromeda. So what are we waiting for? Let’s go look for them! We know sub-halos are going to be clustered nearby their host galaxy and decrease in population quickly as you look farther from the galaxy center. This means that we only need to survey relatively close-by M33. Today’s paper predicts that if a survey covers the full area out to 100kpc away from M33’s center we should find 90% of the total possible number of satellites. On say, HSC, that would mean 100 ‘observing fields’ (1 observing field = 1 field of view, which is the area of the sky that a telescope is sensitive to). If you want to find the faintest satellites possible (and you do, because we need to find EVERY possible satellite to make any sort of conclusion of the history of M33’s motion or to support/undermine ΛCDM ), you will need 12-14 nights of observing time. That is A LOT of time. But, there’s a new telescope on the horizon that can get this done more efficiently. WFIRST is a wide-field, space-based telescope. That means it won’t need to take 100 pictures around M33 to cover the full area, and it doesn’t have the Earth’s atmosphere to look though. WFIRST would be able to survey the same area in only ~4 hours! 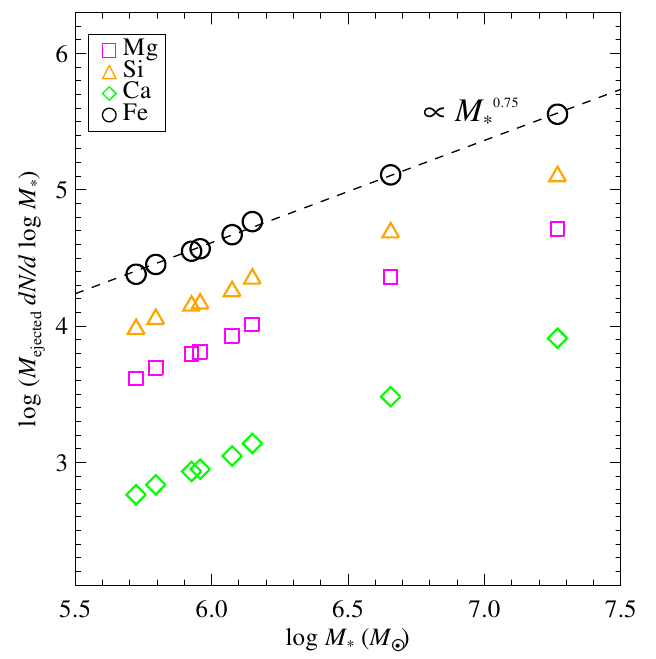 For just about anyone interested in dwarf galaxies, cosmology, tidal stripping, and the history of our local group, this paper proposes a very interesting WFIRST mission. what’s the meaning of the yellow vertical dashed line? If it is ” limiting brightness”, why it looks still have some data on right of the line? Every telescope/survey is only going to be sensitive enough to objects of a certain brightness/magnitude depending on the sensitivity of the instrument and how long that instrument is staring at a patch of sky. For the PAndAS survey, they were only sensitive to objects of around -6.5 mag. Anything fainter than that (which most ultra-faint dwarf galaxies are) they would not have been able to detect. Thanks for the question! Hope that’s clear. oh,I see. Thanks for your answer. Many thanks for this excellent overview and summary.